In C++ and Java, the iteration statements, for loop, while loop and do-while loop, allow the set of instructions to be repeatedly executed, till the condition is true and terminates as soon as the condition becomes false. Conditions in iteration statements may be predefined as in for loop or open-ended as in while loop. There are some major differences between for and while loops, which are explained further with the help of comparison chart. Format Initialization, condition checking, iteration statement are written at the top of the loop. Only initialization and condition checking is done at the top of the loop. Use The 'for' loop used only when we already knew the number of iterations. The 'while' loop used only when the number of iteration are not exactly known. Condition If the condition is not put up in 'for' loop, then loop iterates infinite times. If the condition is not put up in 'while' loop, it provides compilation error. Initialization In 'for' loop the initialization once done is never repeated. In while loop if initialization is done during condition checking, then initialization is done each time the loop iterate. Iteration statement In 'for' loop iteration statement is written at top, hence, executes only after all statements in loop are executed. In 'while' loop, the iteration statement can be written anywhere in the loop. In Java, there are two forms of for loops. The first form is “traditional” form and the second is “for-each” form. The general form of traditional for loop statement. The initialization of the loop controlling variable of for loop is executed only once, during the first iteration of the loop. Here, the loop controlling variable is initialized, sometimes if the loop variable is not used again anywhere in the program and is only used as the controlling variable of the loop, then it is both declared and initialized in the for loop. The condition of the for loop is executed each time the loop is iterated. The iteration statement is an expression that increment or decrement the loop controlling variable. Whenever the loop is executed, its initialization condition is executed first; then the condition is checked. If the condition is satisfied the body of the loop is executed, then the iteration statement is executed. Then again the condition is checked to know whether the loop will iterate further or will terminate. In Java, the initialization statement and the iteration statement may include more than one statement. Each statement is separated by other by a comma, in Java, a comma is a separator whereas, in C++, “comma” is an operator that can be used in any valid expression. The “for-each” form is an enhanced for loop. The general form of the for-each loop is as follow. Here, the “type” specify the type of iteration variable followed by the iteration variable. The iteration variable will receive the element from the collection variable. The type must be same as the type of elements stored in the collection variable. The for-each form of for loop automates the iteration of the loop from starting to end accessing the values in sequential order. There are various types of collection used with for loop. Let’s discuss it with an array as a collection. Here, ‘c’ is an iteration variable; it receives the values from array[ ], one at a time, from lowest index to the highest index in the array. Here, the loop iterates until all the elements of the array are examined. It is possible to terminate the loop in between by using “break”. However, the change in the iteration variable does not affect the array, as it is only a read-only variable. The while loop is the most fundamental loop available in C++ and Java. 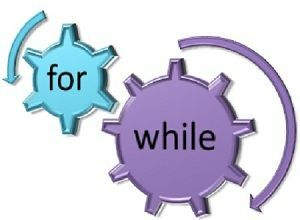 The working of a while loop is similar in both C++ and Java. The declaration of a while loop is as follow. The while loop initially checks the condition and then executes the statements till the condition in while loop turns out to be true. The condition in while loop can be any boolean expression. When expression returns any non-zero value, then the condition is true, and if the expression returns a zero value, the condition becomes false. If the condition becomes true, then loop iterates itself, and if the condition becomes false, then the control passes to the next line of the code immediately followed by the loop.The statements or the body loop can either be an empty statement or a single statement or a block of statements.Let’s discuss the working of ‘while’ loop. In the example below the code will print from 1 to 10. Let’s discuss the working of a while loop. In the example below the code will print from 1 to 10. Here, the initial value of ‘n’ is 0, which makes the condition in while loop true. The control then enters the body of the while loop and the value of ‘n’ is incremented according to the first statement in the body of a while loop. The value of ‘n’ is printed, then the control goes back to the condition in a while loop, now the value of ‘n’ is 1 which again satisfies the condition, and the body of the loop is executed again. This continue till the condition is true, as soon as the condition become false the loop is terminated. Like for loop, the while loop can also initialize the control variable at the top of the loop i.e. during condition checking. Here the control variable ‘ch’ is initialized and the condition of the loop is verified at the top of the loop. May it be a for loop or a while loop, if there is only one statement in the body of the loop, the curly braces are not required in that condition. In for loop, initialization, condition checking, and increment or decrement of iteration variable is done explicitly in the syntax of a loop only whereas, in the while loop we can only initialize and check condition in the syntax of the loop. When we are aware of the number of iterations that has to occur in an execution of a loop then we use for loop. On the other hand, if we are not aware of the number of iteration that has to occur in a loop then we use while loop. If you fail to put condition statement in for loop it will lead to an infinite iteration of a loop whereas, if you fail to put condition statement in the while loop it will lead to compilation error. The initialization statement in the syntax of for loop executes only once at the start of the for loop. On the other hand, if while loop is carrying initialization statement in its syntax then the initialization statement in the while loop will execute each time the loop iterates. The iteration statement in the for loop will execute after the body for loop executes. On the other hand, the iteration statement can be written anywhere in the body of while loop so, there can be some statements that execute after the execution of iteration statement in the body of while loop. The for loop and while loop both are iteration statement, but both have their distinct feature. The for loop do have all its declaration (initialization, condition, iteration) at the top of the body of the loop whereas in while loop only initialization and condition is at the top of the body of loop and iteration may be written anywhere in the body of the loop.